I’ve believed all my life that a dog is man’s best friend, but there truly is nothing like the relationship between a dog and their “kid.” I’ve seen it as a dog mama and now as a photographer. Primarily, I am a Woodlands cake smash photographer, but this little session is part two of my most recent family session on the beach! 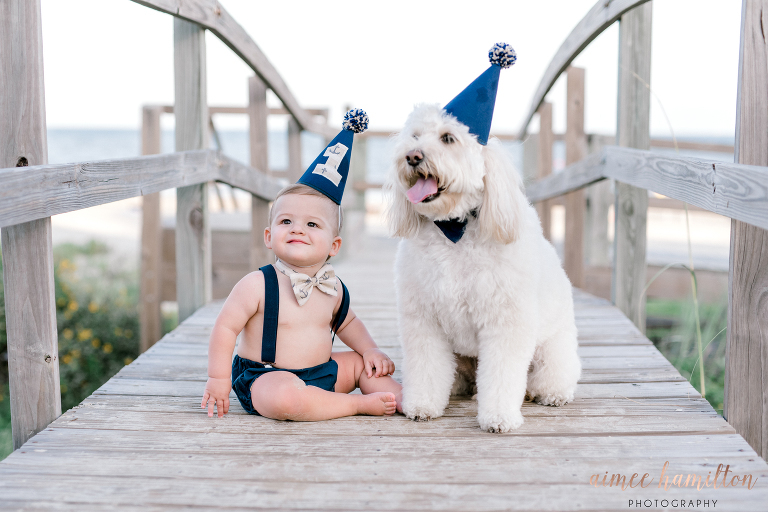 This little man was able to celebrate his birthday on the beach with his very best friend! His mama called me early in the summer and said that their pup was part of the baby’s gender reveal (a cake) and so it would be just perfect if he could also be part of the cake smash. Ladies and gentleman, let me present to you, the most adorable milestone session there ever was! Check out his little birthday outfit? 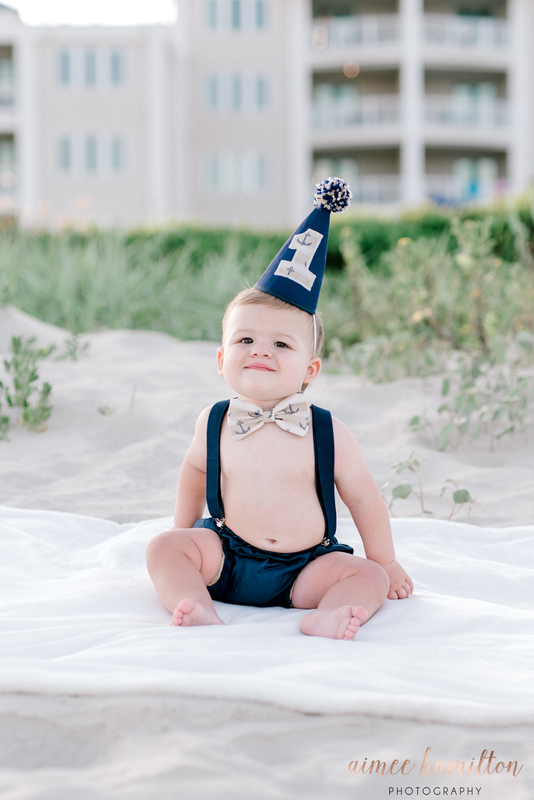 I’m a sucker for a baby in suspenders, but his mama did an excellent job choosing an outfit that photographs well and coordinates perfectly. The hat on the pup just doesn’t get any better does it? 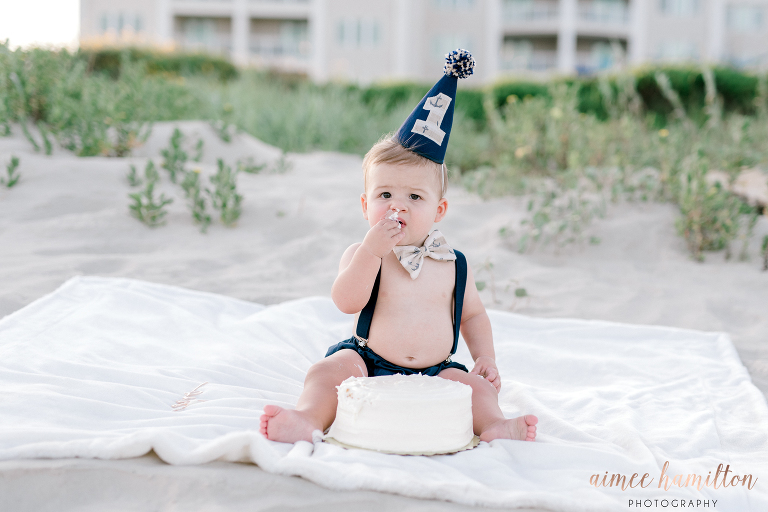 For more cake smash outfit ideas, check out this adorable set! I love supporting other small business owners and getting a custom look! Okay, this is the part that is just going to make your heart melt! Mama bought a gorgeous white cake for the boys to share. We laid out a sweet little blanket to avoid the sand and make clean up a breeze. Then, we let them dig in! I wasn’t sure he was going to like it after his first reaction, but I think he may have changed his mind! I think both baby and pup were big fans of the icing! It looked like the super soft icing that just melts in your mouth! Sometimes, we have to “hide” fruit or favorite snacks I the icing to help the baby try it, but not this guy! He dug in! Milestone sessions are so much fun y’all! 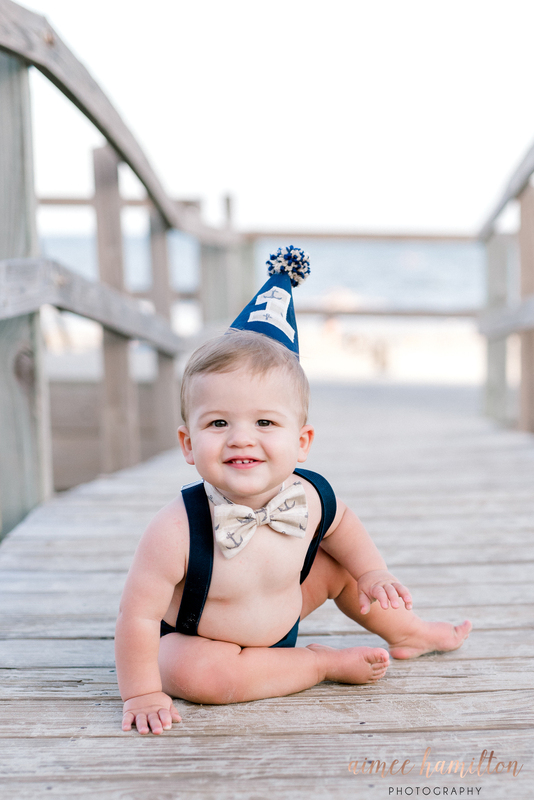 If you have a baby with an upcoming birthday, give me a call before they are walking and we can get to chatting! For more information, or to book Baby’s First Year plan, contact me here! Part two of this family session in Galveston, TX is also on the blog!